After maintaining a more or less exclusively modern focus for much of the history of Things I Learned From Movie X, I decided to change it up a little and instead write about a classic - well, old - film in the shape of Michael Cimino's legendary fiasco, Heaven's Gate, a film which had such grandiose ambitions, and so little control being exercised over them, that it bankrupted its studio and played a major part in ending the auteurist-driven New Hollywood era of the '60s and '70s. This was the second time that I had seen Heaven's Gate and I have to say that I liked it a lot more than I did the first time. Don't get me wrong, I still thought it was interminably tedious and dire in so many respects, but I could better appreciate the visual beauty of the piece, the sheer scope of it (I mean, that shot at the top of the post might look passe in our "you can do anything with CGI" age, but to actually construct that town and bring all those extras in for the purpose of that one shot is nothing short of astonishing) and the all-consuming ambition that drove the production, and drove it off the rails. 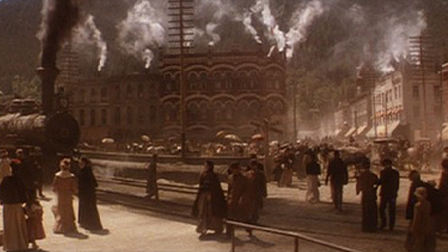 I'm absolutely fascinated by Heaven's Gate, and even though I don't actually like it at all, I'm glad that I rewatched it and got to experience this beautiful, frustrating film again.